I’ve heard many people say that you know the true people of God by their joy. Today was a particularly joyful day for our pilgrim group, and I know it came from the extraordinary encounters we had with God’s presence. In the morning, we traveled up to the top of Mt. 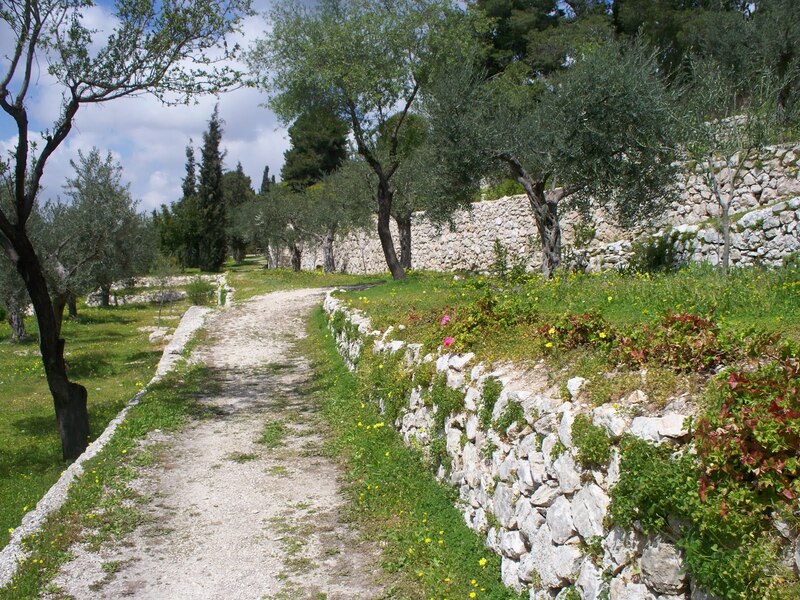 Tabor, the place where Jesus was transfigured (see Matthew 17; see photos). The church, taken care of by the Franciscan friars, was stunningly beautiful. After an introduction to the site and surrounding area, we had an hour to experience God in silent prayer, meditation or Confession. Immediately, I was drawn to the left of the main altar (see photo), where the Blessed Sacrament is kept. There, pilgrims from around the world were prostrate at the feet of the Lord, much like Peter, James and John fell prostrate at the sound of the Father’s voice (Mt. 17:6). So I sat down amid them and opened my Bible to Matthew 17. In an experience that I can only describe as Spirit-led, I became extremely engaged with this relatively short Scripture passage. Previously, the story had not meant much to me. It had seemed like a story that just told us how these three disciples knew Jesus’ glory. Yet, as I sat there at the feet of Jesus on the top of this blessed mountain, God guided my eyes to read each verse over and over again. With each reading, I began to understand – the eyes of my mind were enlightened. I saw Jesus bringing his three close friends aside, trekking the terrain with them, and making the steep climb to the top of this mountain – which stands higher above the rest. I marveled at Jesus’ glory revealed to the three in his transfiguration. I laughed at Peter’s eagerness to begin erecting tents for their visitors. I understood the disciples’ fear upon hearing the voice of the Father booming from Heaven. I found comfort in the fact that, when they lifted their eyes after being afraid, they only saw Jesus. By the time I was finished, I was so convinced of God’s presence and majesty in that place that I knelt with my face to the ground. My mind contained no words or images. All I could do was worship the Son of God. Mary Jane has told us that we are “on a honeymoon with Jesus” in Galilee. The landscape is lush and fertile, with fruit ripening on trees everywhere. As we finish this ‘honeymoon’ and transition to the rocky, desert Judean area, we give abundant thanks for these days of prayer in Galilee. May God use the graces and joys of these past few days to strengthen us, so that we may support the crosses that we carry into Jerusalem. One of the toughest tasks for us while reading Scripture is to picture ourselves in a Gospel setting; when Jesus preached the Sermon on the Mount, how could thousands of people have heard Him preach? What did the sun look like and the air feel like? What do the waves of the Sea of Galilee sound like? Well, that all became a little easier for us pilgrims. And when Jesus said, “He who eats my flesh and drinks my blood has eternal life,” I always wondered: what did that place look like? Today, we celebrated Mass there, over the House of St. Peter in Capernaum (see John 6; see photos). I feel like I am living the Gospels. During Mass, our prayers were accompanied by many sniffles and the sound of hands brushing away tears. The Holy Spirit is working so powerfully among us here, teaching us each a separate, necessary, and beautiful lesson at every holy site. As a Catholic, to consume the Holy Eucharist at the very place where Jesus preached the Bread of Life Discourse was second only to Heaven. I feel blessed beyond words can describe. This all made today a time during which we were all fed by the Lord Jesus. In His Body and Blood, by His Word, during a healing service at the shores of the Sea of Galilee, and in our souls by experiencing the places where He comforts us (“Do not be afraid”) and challenges us (“Do you also want to leave?” “Do you love me?”). The final journey of the day for many of us was a mile-and-a-half walk along the Sea of Galilee in silence. Take this blog and these photographs in your mind and spirit. As we offer your intentions at each holy place, we pray that you will be transformed by Jesus. Christ heals and then challenges us, so that we may grow into more whole and entire versions of ourselves. Let us say, "Yes, Lord." Many tears were shed in our pilgrim group today. Most of our day today was spent in Nazareth, particularly in the Basilica of the Annunciation, where the angel Gabriel appeared to Mary (see Luke 1). The basilica is built over the very cave which was Mary’s house, the place where Christians have maintained for two millennia that the Word became flesh in the womb of this courageous and faithful young woman. We were able to kneel in this (click for pictures) place, where a tiny Tabernacle reminded us that Jesus dwelt as a little unborn baby in his mother’s womb. Some of us were praying for mothers trying to conceive, others for tiny children who needed love. The parents and grandparents among us prayed fervently for children and grandchildren. Before we even entered the basilica, I already had tears welling in my eyes. How precious a place this was – to be in the town where Jesus grew up – and where He became like me, a human being. As we walked into the basilica, the Holy Spirit had moved me to open my Bible to Luke 1. We approached the center, where steps lead down to the grotto house of Mary. It is a simple, small cave, but I was moved beyond words. Tears ran down my face as I smiled in awe of the simplicity. At three o-clock in the afternoon, we had the privilege of celebrating Mass at the altar area built in front of the grotto, and Father put into words what had truly moved me. At this simple cave, God sent a messenger angel, Gabriel – whose name means God’s strength – to Mary. God’s strength, Fr. Valentin said, is especially with the meek and humble. At this place, God came to a meek person of simple livelihood, a woman, a young woman, a woman who had not even been married – and dwelt within her as a helpless human baby. How many times have I thought that I was just a nobody? How many times have I thought that my thoughts and actions won’t make much of a difference? Yet in this tiny village where perhaps 10 to 15 families lived, Almighty God came in His Fullness. We were blessed with a few minutes of silence, without any other pilgrim groups in the basilica. As we all stood before the grotto with our eyes fixed on that simple cave, I asked God to forgive me for ever doubting Him. How great is our God. I have no idea how long we travelled to get here. Mary Jane said it was something like 30 hours. All I know is, we’re all extremely tired, sore, aching, weak – but happy. We made it to the Holy Land. – I was stopped by Israeli security on the way in from our flight. Apparently, I look like a potential peace worker, so I had to be questioned. Father Valentine looks like an Arab, so he was stopped, too. We both agreed: that guy was scary. Tears welled in my eyes as I realized that I was finally here. In this ground, Abraham is buried. In these caves, Elijah and his followers heard God whisper. On this dirt, my Savior shed blood out of love for me. In these towns, the apostles spread the Gospel. I’ve only been in the Holy Land for a few hours, and already my faith is so much more real to me. It’s more than a collection of stories now, more than the theories that I have built my life upon – although they certainly meant more to me than these simple analogies convey. But being here makes it real. I sympathize with St. Thomas even more now. I’m seeing and touching, and it’s leading me to new belief. That chair you’re sitting in? For a few moments, forget that it’s there. Imagine that it’s the bank of a river. Take a few moments and breathe in the clean air. Smell the grass around you. Hear the water running gently. Feel the sun on your skin. See the gorgeous, blue sky. 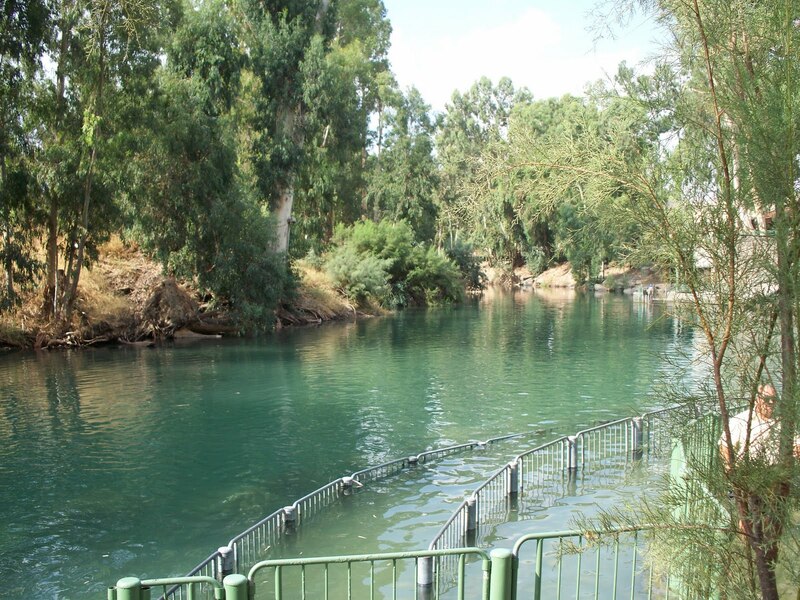 Now, imagine that you’re sitting on the bank of the Jordan River – the very waters that Jesus Christ felt on his skin and hair as he was baptized by John. That’s where I’m going – and I’m taking you with me. I work for a non-profit Catholic evangelization ministry in San Antonio called The Pilgrim Center of Hope. Through our Ministry of Pilgrimages, we take small groups (no more than 40 persons) to the Holy Land so that they can experience it. These pilgrimages are not “religious tours” but true, spiritual journeys. We maintain a prayerful attitude, keeping our senses and our souls open to meeting God in the place where he revealed himself fully through the person of Jesus Christ. For the upcoming two-week pilgrimage, we invite you to join us. We will be posting blogs like these, with stories and spiritual reflections, as well as photos and videos that will chronicle our journey and bring you along with us. On our website, we offer you a daily Spiritual Pilgrimage guide that gives you a short description of each day’s activities and a daily prayer. We especially encourage you to share your personal prayer intentions with us either by commenting on this blog or via email. Then, as we walk in the footsteps of Jesus and his disciples, we will carry your petitions with us and offer them at each of the holy sites we visit. This is a unique opportunity to seek God, to see the Scriptures come alive, and to meet the inhabitants of the Holy Land in a personal way. Come – join us; the first day is fast-approaching. Catholic Women's Conference – A Spiritual Success! The 9th annual Catholic Women’s Conference was held on October 1-2 at Antonian College Preparatory High School Auditorium. Close to 500 attendees experienced a grace-filled and powerful event. As a local Catholic writer for “Today’s Catholic” wrote; the Conference is a relaxed atmosphere to reconnect with God! It was a place where women gathered with other women in prayer and “just be”….be open to the Holy Spirit, to the speakers’ presentations, to learn and to be healed. Margarett A Schlientz, Ph.D. has presented at over a thousand conferences on the integration of psychology and spirituality – she spoke on the healing power of prayer and of the Eucharist. Donna Marie Cooper-O’Boyle was blessed with a friendship with Blessed Mother Teresa of Calcutta; she shared her personal reflections and give insight on how to continue Mother Teresa’s lessons of love. Rula Shubeita, born in the Old City of Jerusalem, who works as a guide with Christian pilgrims from all over the world shared her experience as a Christian Palestinian Woman living in the Holy Land. The Steering Committee of 12 women praise God for the Conference and continue to pray for the women who attended. The Lord continues to “till the soil in souls”. May we rejoice in hope! For CD’s of the speakers’ presentations; contact us at 210-521-3377 or email us at trust@catholic.org. 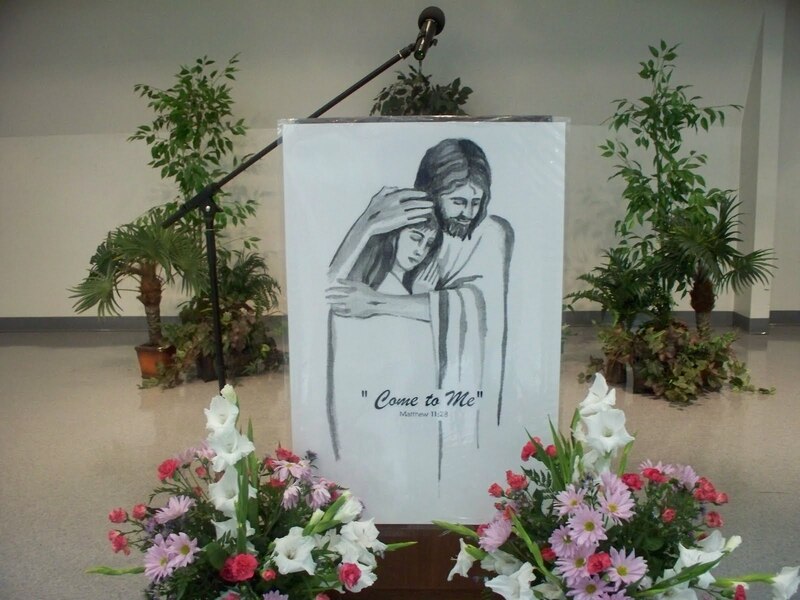 For photos and videos; go to our website at http://www.pilgrimcenterofhope.org/. Click on media icon. The 10th Catholic Women’s Conference will be scheduled in the Fall of 2010…date and location will be announced soon.